* ADJUSTABLE BASE: An adjustable base for a perfect fits firmly in the cup holder of cars, trucks and other vehicles. * ADJUST & ROTATE: Rotate and position your device to the optimum viewing angle with the flexible gooseneck. The device can be mounted in any preferred orientation, horizontally or vertically for different application. * INSTALLS IN SECONDS: Mount can be installed or removed in seconds without tools and without damaging your vehicle. * UNIVERSAL COMPATIBILITY: Fits for most tablets and smartphones. 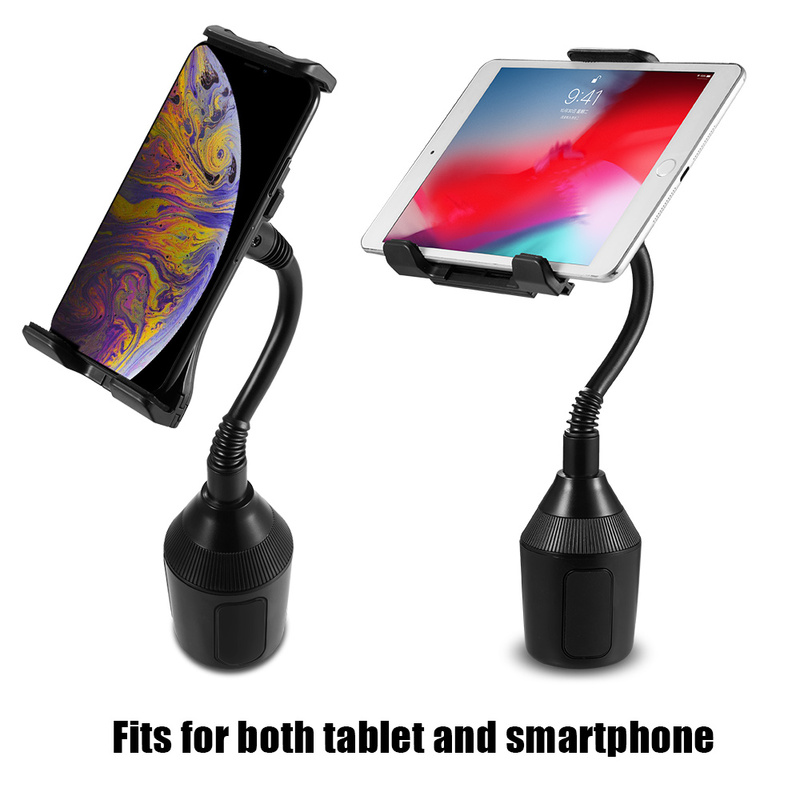 Tablet holder supports any iPad or other tablet 7 to 10.2 inches.Such as Apple iPad Mini 4/3/2/1,iPad Air 1/2,Samsung Galaxy Tab A 8/9.6/10.1 inch,Samsung Galaxy Tab S/S2. SMARTPHONES MODELS including Apple iPhone XR / XS MAX / XS / X / 8 / 8 Plus, 7, 7 Plus, 6S, 6S Plus, 6, 6 Plus, 5s, 5, Samsung Note 9, Galaxy S10, S10 PLUS, S10E, S9, S9 PLUS, S8, S8 PLUS, S7, S6, J7, J5, LG, Google,Moto and Nokia etc.